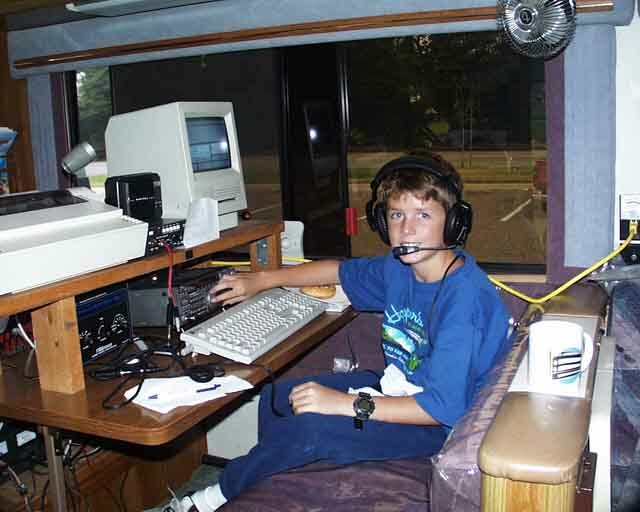 Matt Anderson, son of Howard WB6TIK, got to try his hand at Field Day in the 20M station and could be hooked on Ham Radio. 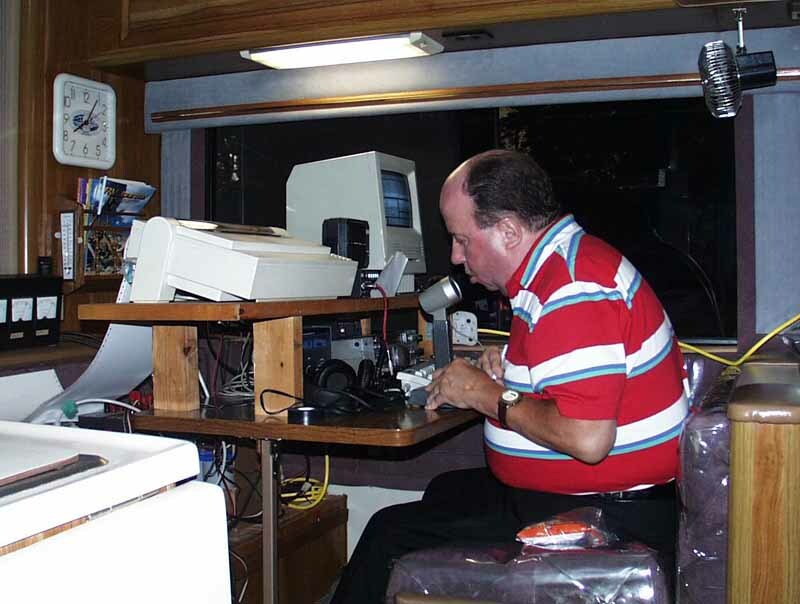 David-W7KTS tries his hand at the 20M station that is in the KE6WWK motorhome. 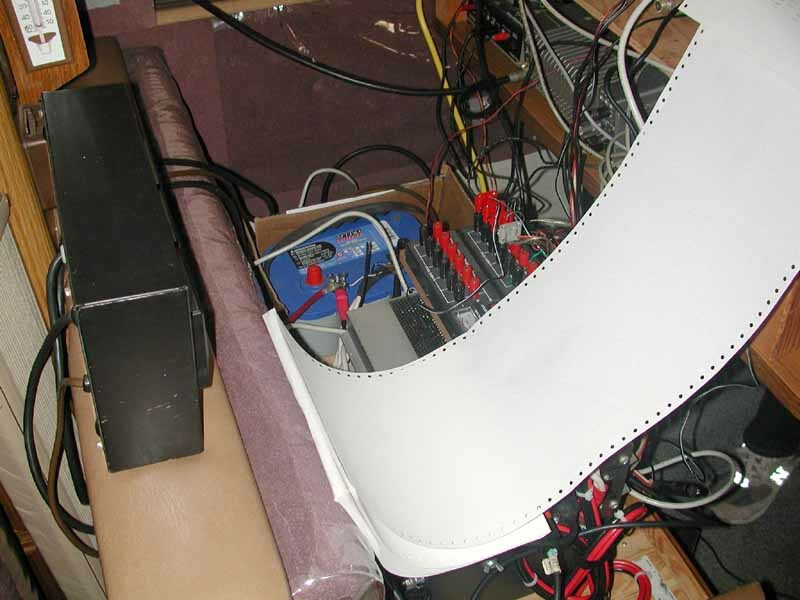 To support the 20M MAC computer for logging is this Uninteruptable PS supplied by John-WB6AJE. 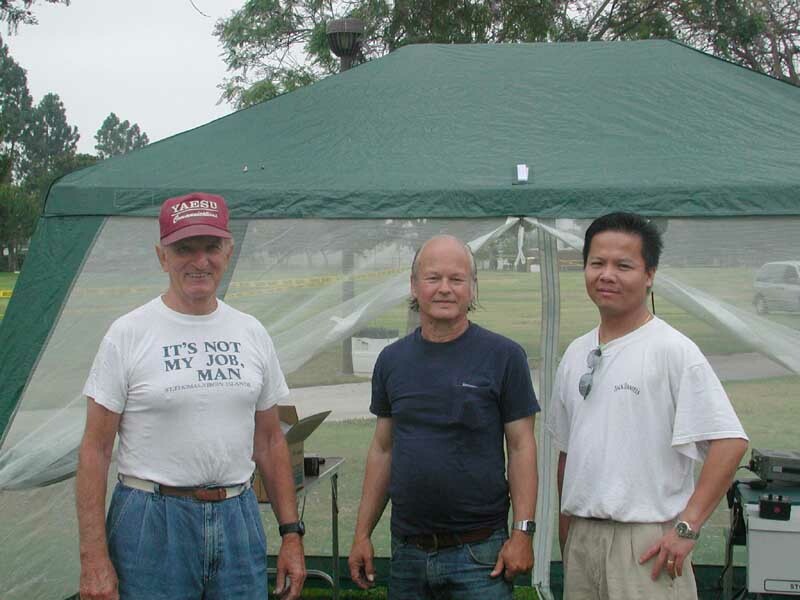 Three members of the team that manned both the 40M SSB/CW station and the 75M SSB station stand infront of the tent for both transmitters. 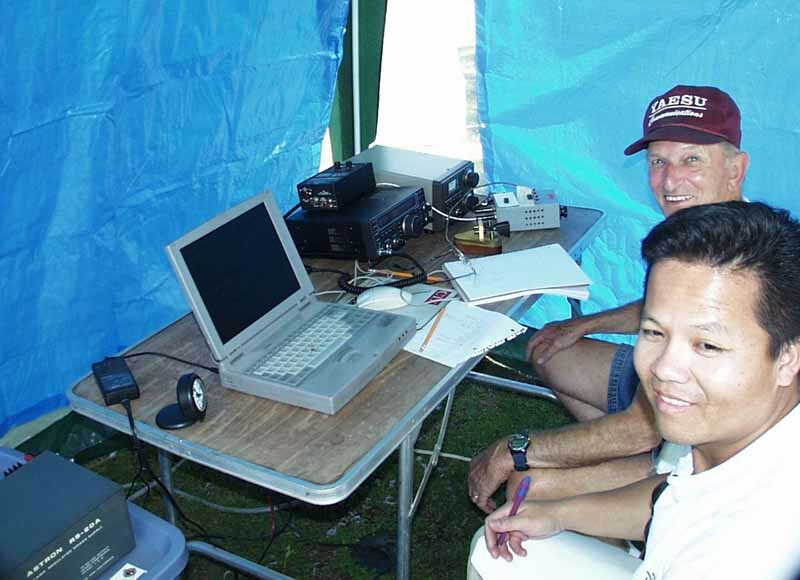 (L-R) Chris-W6KFW, team captain Larry-K6VDP and Stephen-KG6QVY. 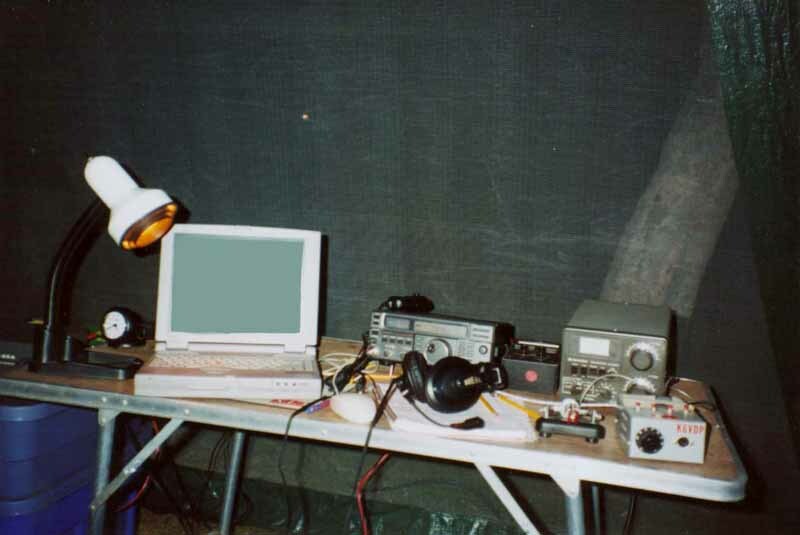 Here is a clear shot of the rig and logging computer FD set-up used for 40M SSB and CW. 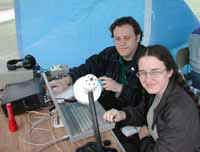 Two of the many operators taking a turn at the 40M station are Chris-W6KFW (top) and Stephen-KG6QVY (his first FD!). Another set of operators for the 40M station were (L-R) Matt-K6LNX and Robyn Guest (a friend of Matt). Here is Chris-W6KFW operating the 75M station inside the 40M/75M tent. 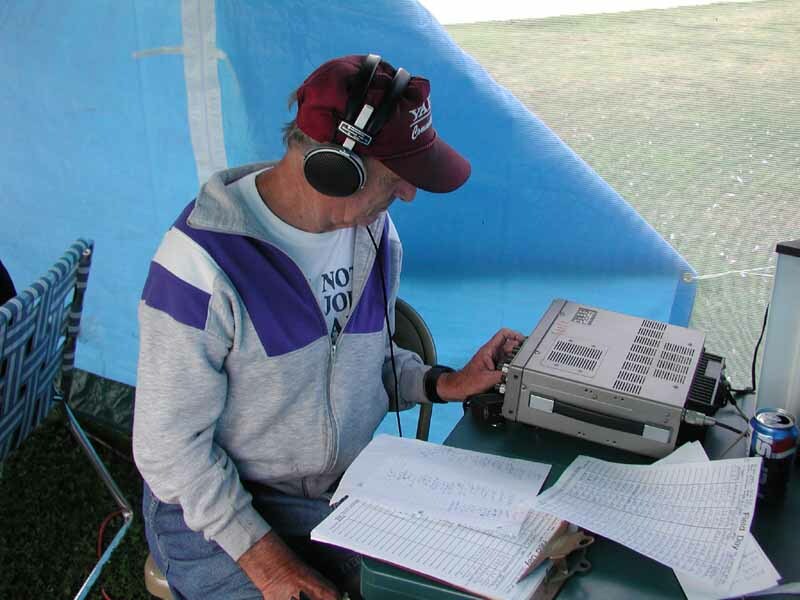 Some of the best times at Field Day are just spent talking around to other HAMs. 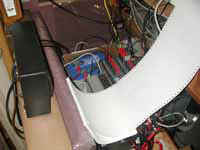 (L-to-R) Chris-K6KFW, Larry-K6VDP, Steve-KB1GZ (bottom head), Bruce-KC6DLA, and Lowell-KQ6JD. 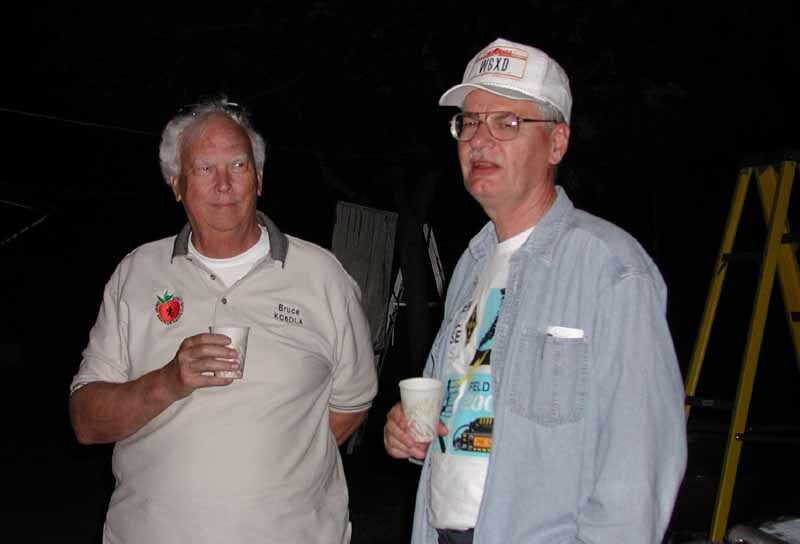 Bruce-KC6DLA (L) is ragchewing with visitor Art Goddard-W6XD, ARRL SW Division Director, who is explaining the ARRL's "5-year plan to improve radio propagation". 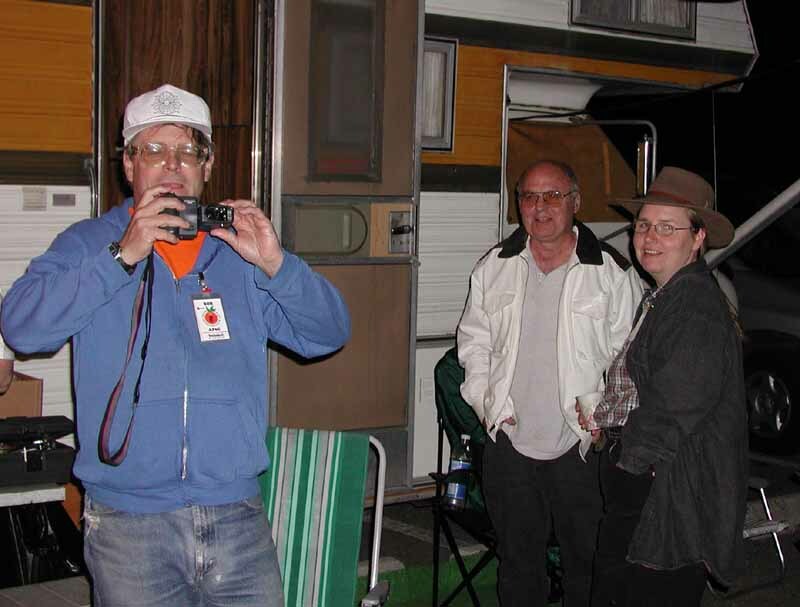 The night-time cake/sake/sushi party is being photographed by (L-R) Bob-AF6C, Bob-KD6XO, and Corry-AE6GW. 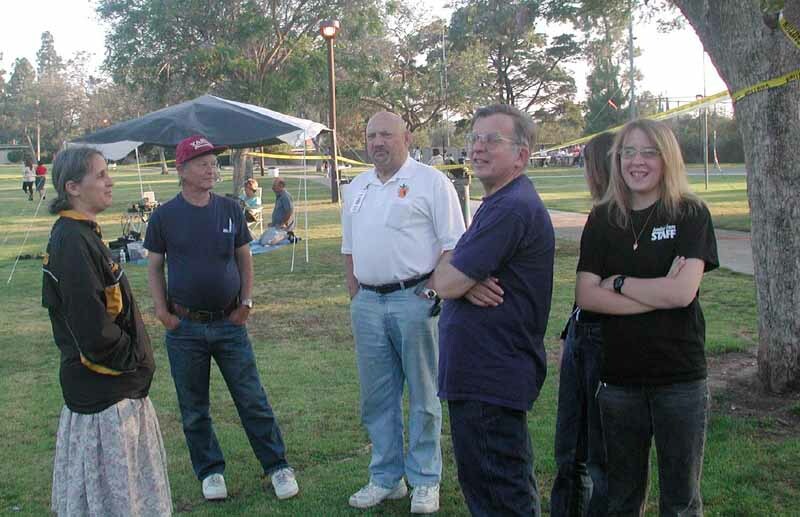 The "travelling ARRL Gang" arrived at the OCARC FD site just in time for the night-time party. 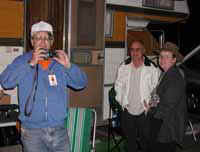 They toured many many club FD sites throughout Saturday and Sunday. 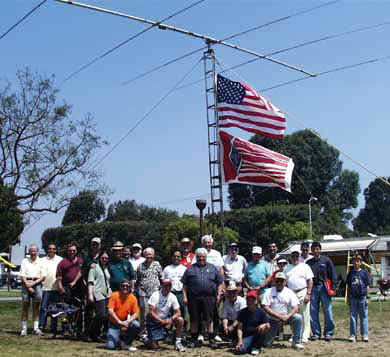 (L-R) Steve-KB1GZ, Larry-K6LDC, Lowell-KQ6JD, Sandy-WA6WZN, Tuck-NZ6T (ARRL Asst Dir), Fried-WA6WZO (ARRL 3rd VP), Bob-AF6C, Bruce-KC6DLA, Art-W6XD (ARRL SW Dir), Matt Anderson (visitor), Harold-WB6TIK (visitor and father of Matt), and John-WB6AJE (hidden visitor). "Real Hams eat quiche". 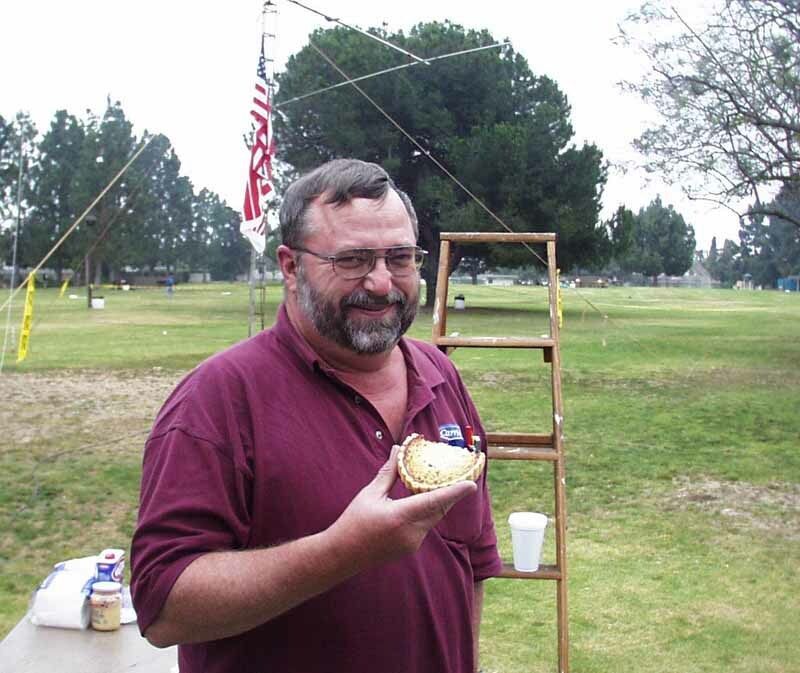 Our food chairman, Don-KC6ONZ, provide delicious quiche for our breakfast at Field Day. 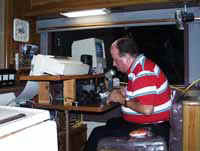 Bob-KD6BWH shows his enjoyment as he samples the food. 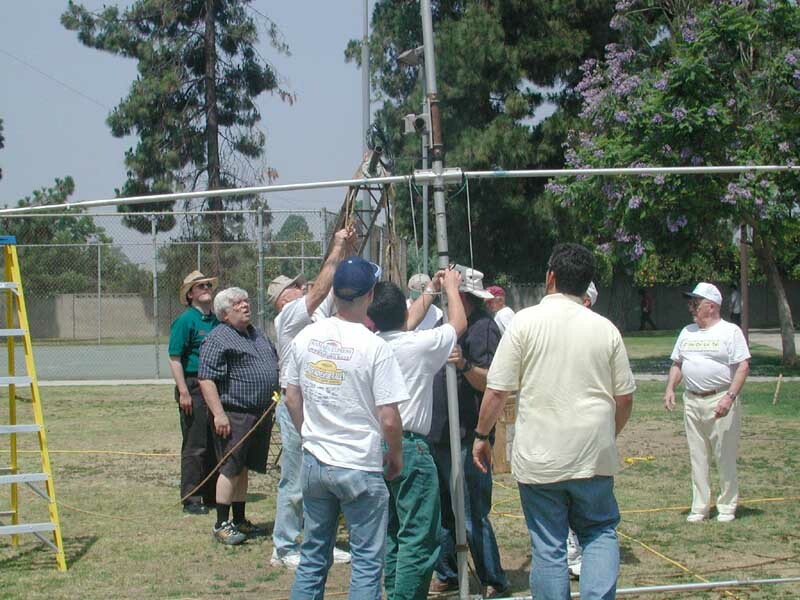 It takes a lot of teamwork to take down the15M tower and 5-ele beam after the contest is finished. 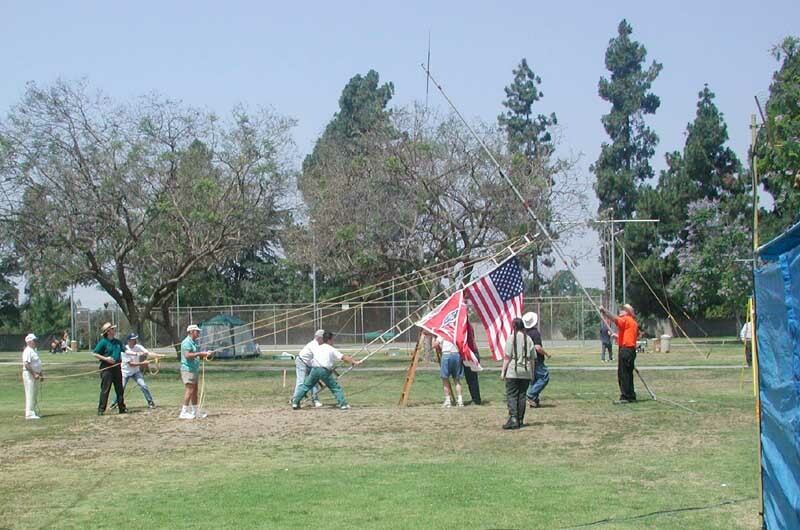 (L-R) Gene-KF6TRA, Matt-K6LNX, Carl-WA6BSV, Paul-WD6FMX, Larry-K6LDC, Stephen-KG6QVY, 2 hidden OPs, Robyn Guest, Ken-W6HHC (white hat) and Lowell-KQ6JD (orange shirt). 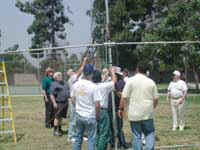 The team of teardown artists then moved over to the 20M tower and beam. The beam has just been removed from the tower. 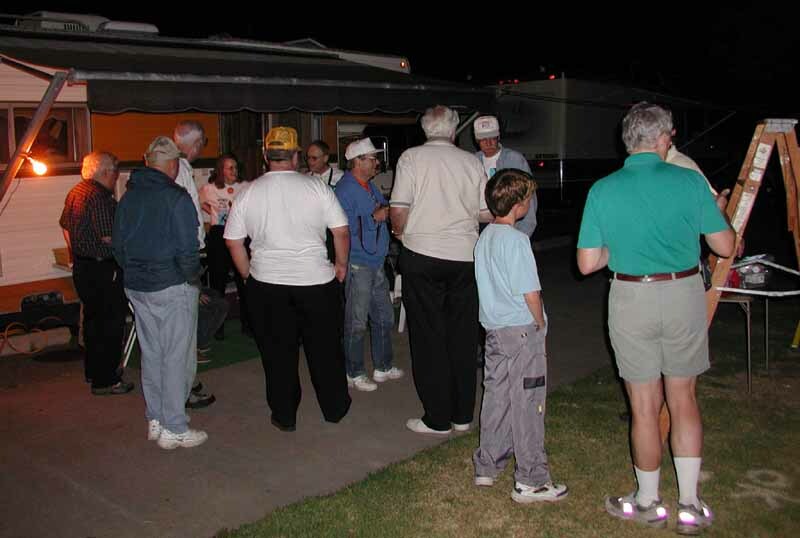 (L-R) Matt-K6LNX, Steve-KG1BZ, Larry-K6LDC, Carl-WA6BSV (blue hat), Stephen-KG6QVY, Rich-KE6WWK (hat with green beak), Ken-W6HHC (white hat), Chris-W6KFW (red hat), John-WB6AJE, and Gene-KF6TRA (white shirt). 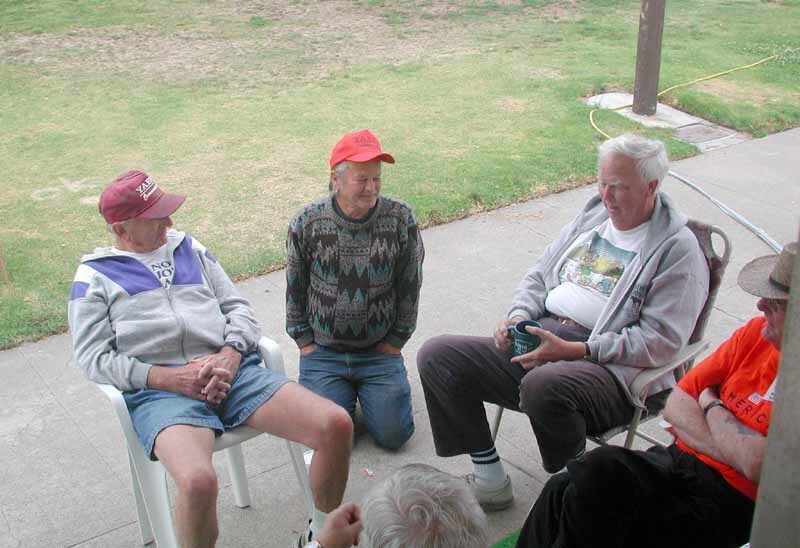 Kneeling in front (L to R): Bob-AF6C, Chris-W6KFW, Bob-KD6XO, Larry-K6VDP, and Larry-K6LDC. Standing in back are (L to R): Howard- WB6TIK, John-WB6AJE, Bob- KD6BWH, John- N6RUI, Robyn Guest (friend of Matt) , Matt-K6LNX, Ken-W6HHC, Rich-KE6WWK, Tom-WA6PFA, Stephen-KG6QVY, "El Presidente" Lowell-KQ6JD, Steve-KB1GZ, Bruce-KC6DLA, Bud-WA6VPP, Paul-WD6FMX, Ken-WB9YCJ, Tina Brost (wife of Gene-KF6TRA), Gene-KF6TRA, Carl-WA6BSV, Chris-KF6LEX, and Matt Anderson (son of WB6TIK).